Saya is in my freshman English class this year so is finding herself being compared to me at every turn. 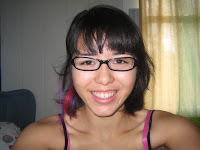 Something to do with her 1/2 Japanese heritage and black framed glasses. Truthfully, we don't look that much alike; people just kind of think that all Asians look the same. She's much cuter than I am, and she knows it. The first time this comparison happened her face had this look as if she had just been slapped. Pretty soon she started seeing the benefits of being a sister to her English teacher, but I still kick her out of my teacher's chair every time. Luckily, she's pretty hard working and down to earth, so I don't have to worry about her taking advantage of much. She's also the kind of girl that you want to be friends with immediately because she's funny (ha ha) and strange (fun) and for that reason I'm flattered by the comparison. This is also the girl that if she's in the right silly mood can be particularly, well, truthful. The kind of truthful that adults always applaud kids for having, but often just means that they know exactly how to insult you. I've been insulted plenty in that class (one girl asked what my body fat percentage was), but Saya hit a new level a few days ago. All in the same class period she said that I didn't have very many shirts (because someone accused me of wearing the same shirt 2 days in a row), felt my arm and asked me what was wrong with it (because of all the bumps on it, due to a skin condition called KP) and then when I explained what it was she thought it was also on my nose (I'm guessing she's referring to blackheads or something), and butted into another conversation I was having with a student and asked me how much I weighed. When I asked her for a picture for this post, she asked me why, suggesting that I needed to put it as my profile picture because I thought I was too fat for a picture. Cute, isn't she? But this entry is not how I cried myself to sleep that night (kidding), it's about how she told me that she and her friends hopped on a bus after the literature festival to go see a movie. It was strange, but I was immediately jealous of the freedom that someone, anyone might have to do such a thing. I hate riding the bus, I definitely hate "Prom Night" (even without seeing it), yet the idea that kids can, completely independent of obligation and responsibility to other people, act in response to selfish interests. I found myself thinking, "What? Didn't you have things to do? Homework? Parents to attend to?" Of course the answer to these questions just reveals the difference between us. Normally I don't feel burdened by my responsibility (I rarely feel the need to run away and breathe for a couple of hours) but I suddenly realized, in an overwhelming way, that I am light years away from the kind of spontaneous freedom kids take for granted. Instead, they complain about the responsibilities that they do have, which seem so large to them, and exquisite to us. Perspective can be so ruinous to one's current contentment. I'd rather just forget that I ever expressed ingratitude for my irresponsible teenage-hood. And it was largely irresponsible, even if I did practice the piano, participated in sports, hung out with my boyfriend(s), and had AP classes. The key is that you could put the word "play" in front of most items on my list of responsibilites. It was a brief feeling, but I've been considering it ever since. I don't take it to mean that I feel oppressed in any way, or overwhelmed by my busy life, or that I should just take a mid-life crisis leap into an away direction. More that I am so impressed with the folly of youth. And not in a sarcastic way. That's really what is so lovely and innocent about it. what a stinker. how can you stand teaching high school? Interesting. I know Bekah feels this way sometimes. I wish I could hike more. And when the moon is full, I wish I could take advantage of it by jumping point, or night surfing, or hiking out into the desert to a hotspring, but the real problem with those is that I am in Tokyo. But I think since less of my day is devoted to full time child care, I probably don't feel as tied down. I could go and do a lot of things with the amount of time that I have, I just have too many other things to do. Of course, as I am realizing, the time you have really little kids and they need your constant attention, is not that long. In a few more years, Miriam will be able to come surfing, or on the bus to a movie in town, or whatever. Even now she is pretty good hiker. Not that I am trying to lecture, but I need to remind myself of this periodically. As you well know, the time they are little enough to need full time attention is short and precious and well worth the, relatively speaking, small sacrifices it requires. "I rarely feel the need to run away and breathe for a couple of hours"
I've always envied this about you! I'm glad to know that we all have those moments of "perspective" as you put it. It's not that we want to run away, but that we don't have much opportunity to get away from our responsibilities which makes getting away feel like running away. A crazy and beautiful thing it is. And I have to laugh when you write about yourself in such a harsh way. I know you can laugh too. I also feel like I haven't told you enough how beautiful you are. I've always thought so and never mentioned it. Why does it seem like it's easier to tell people bad things about them. Maybe it's just that we notice when people say bad things more that the good things. I don't know, but there are times I wish I looked and acted more like you.